One thousand years after a cataclysmic event leaves humanity on the brink of extinction, the descendants of the chosen survivors take refuge in thirteen contingency shelters buried deep underground, at the bottom of the ocean, and in the far reaches of outer space. In the underwater 13th Continuum, sixteen-year-old Myra Jackson has heard rumors and whisperings all her life of a magical place called "The Surface” where people could breathe fresh air, feel the warmth of something called sunlight on their skin, and see things known as stars and trees and mountains. Myra has never dared to ask whether the stories are true, since the act of speaking such words aloud is an offense punishable by death. But after she discovers that the air supply aboard her underwater colony is running out, she realizes that her only hope for survival is to find this mysterious place. To get there, she must first recover the only guide to the Surface—the Beacon, an ancient device that also connects her to Captain Aero Wright, a dashing young soldier from one of the only remaining space colonies. With the fate of all humankind depending on them, Myra and Aero must escape the tyrannical forces that rule their colonies, journey through the black depths of the ocean and across the cold void of space, to find each other on the Surface that their ancestors once called home. 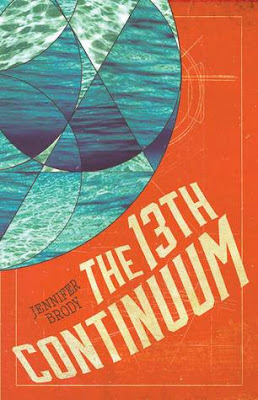 At first glance, The 13th Continuum sounds like a story that's about to take readers through the ring of the gods and right into an interplanetary adventure. Instead, Jennifer Brody debuted a novel that tells about humankind surviving a cataclysmic event and the future generation's desire to return home. The 13th Continuum is equal parts Ruby's Song and The 100 and I can't get enough of it! Brody quickly and efficiently sets the stage for the novel in the opening chapters. Readers get a taste of the time before the Doom, and the life of the Founders of the continuums Post Doom. The world-building isn't long and complicated which easily makes this a YA read for teens who may not already enjoy science fiction. Though the pace of the novel is quite fast, the plot does not lack in structure or fluidity. Brody hits all the right points that one would expect from this type of light science fiction/post-apocalyptic novel and leaves readers ready to dive into even more adventure. The one aspect of the novel that sometimes took me out of the story is the voice of the narrator, which seems to bleed into the dialogue. For the majority of the novel, readers are viewing the story from the perspective of sixteen year old Myra Jackson and Captain Aero Wright. Both have distinctly different upbringings, but somehow have very similar voices. As for the dialogue, sometimes the main group of young characters sound too wise beyond their years or super positive in an unrealistic manner. Other times they all sound similar and not very distinct from one another or the actual adults in the story. It doesn't completely detract from the novel, but so many times I wondered why these characters aren't more developed. What drew me to this series was the promise of adventure, and Jennifer Brody delivers it in spades. The sequel, Return of the Continuums, is bound to be filled with more glimpses of the Post Doom world, more action, and more page turning surprises!